Yikes. This year I completely un-blogged. It would be easy to proclaim that I’ve been too busy or that I made a decision to unplug or that I’ve had nothing profound to say. All of those things have been true at one moment or another, but really I haven’t been writing at all for reasons that have nothing to do with any of that. This year has been all new for me. There has been lots to say. And most of it has felt too personal, too intimate to write about and publish online. I feel different when the wind blows over me, as if I’ve shed a layer of myself and the layer that is bared is tender and unweathered, unused to being exposed. I don’t know how to write about this time. It feels a bit too much like stripping off my clothes in public. It feels like that tipping point when I laugh so hard that I begin to sob. -I need to let my friends know the good stuff and the hard stuff; I need them through it all. -Spanish cheese is delicious but if I eat too much of it, I can’t sleep. -Just because someone isn’t near me, doesn’t mean they aren’t close to me. -Dear friends can be made in the strangest places, even in the lobby of a hotel in Santa Cruz. -When living overseas, a check-in text from someone I love feels like a good hug. -Hot water bottles are magical. So is the rose tea that Holly gave me. -Everyone has something to teach me. -Watching videos of puppies or hedgehogs or baby sloths is strangely awesome. -Saying out loud what I am grateful for is like giving myself a present. -I am powerless but I keep on breathing. -Everyone is going through something, so I can be kind and gentle and listen and not take myself too seriously. -John Steinbeck’s East of Eden is a masterpiece. -Letting people in expands my life. -Being married to Andrew is my favorite thing. -And, as Rayne has been saying for years: Love Is The Best. On first-day-of-school-eve, I can’t sleep. I suffer the tossing and turning and butterflies at the end of every single summer. This past summer was no different, except that the back-to-school jitters were coupled with new-to-India jitters and took over around noon instead of right as I lay down to sleep. I was at school twirling in the last minute craziness swirl and decided that an outing having nothing to do with school might be just the antidote I needed. A new friend agreed to come along. As we were leaving school to head into the maelstrom of traffic, we made a quick plan to head to one of Chennai’s largest and oldest temples. 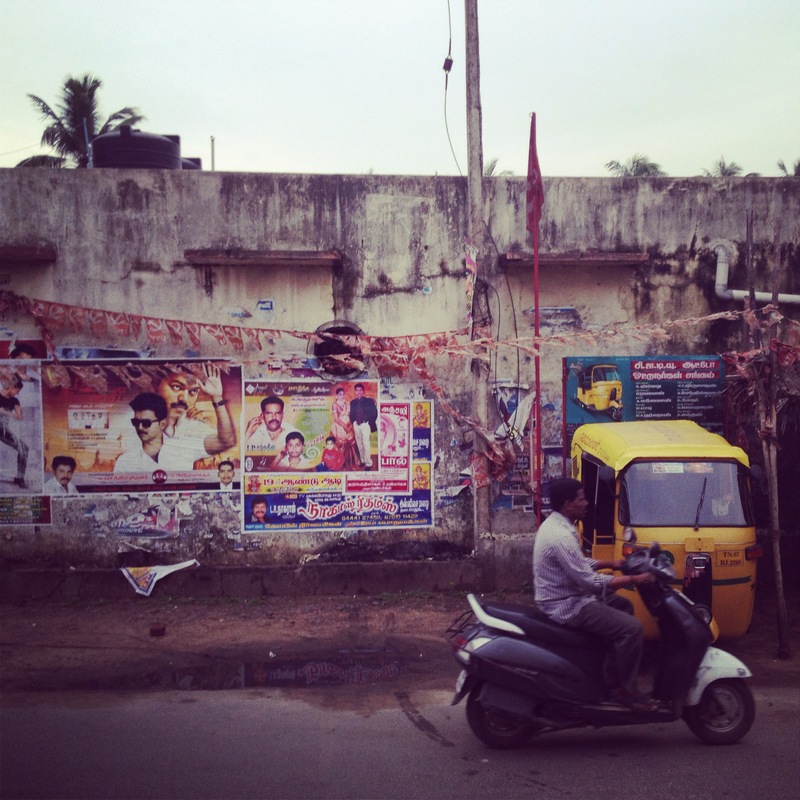 We cruised through the windy, dusty streets of Chennai in an auto-rickshaw, loudly sharing stories over the roar of the engine and the tireless honking. 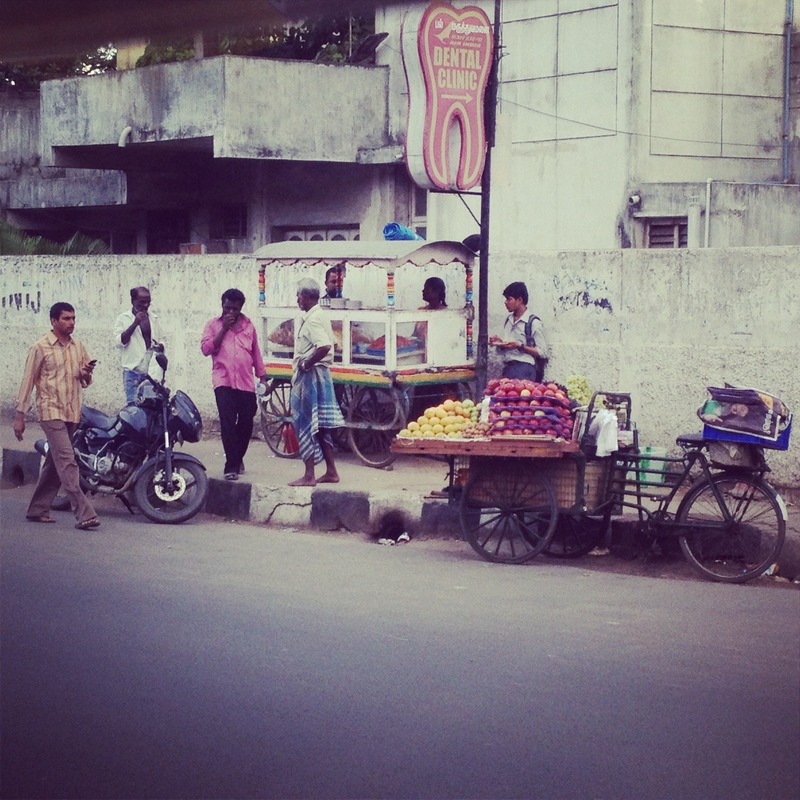 We passed fruit stands, idli shops, storefronts with saris flowing in the breeze. We dodged street dogs and motorcycles, large buses and lazy cows. And we arrived, in one piece, in Mylapore, at the Kapaleeswarar Temple. 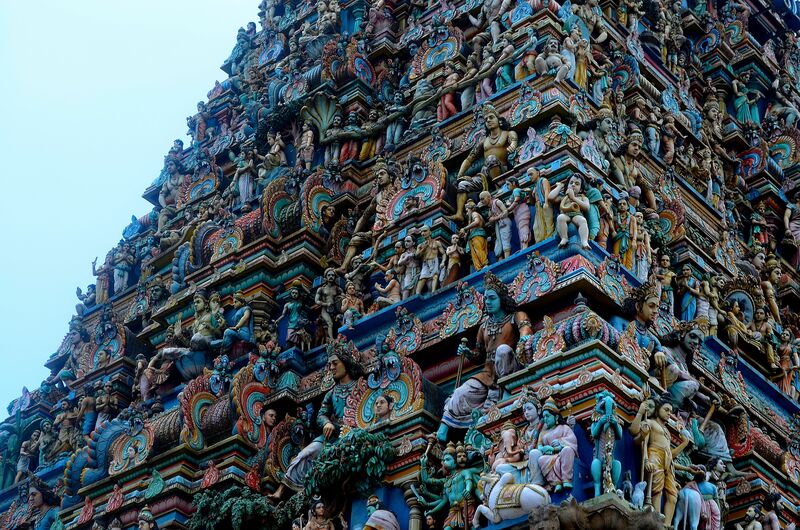 The temple sits majestically in the middle of an old, bustling part of Chennai and dates back to the 7th Century. The entry way to the temple is a tall, intricately carved and painted tribute to one of the legends of Shiva. Inside, we wandered by shrines to Karpagambal, Ganesha, Krishna. We ran into a local friend from school who circumambulated with us, whispering about each of the gods and goddesses and their relationships to each other. Together, we held our hands over the flame at Ganesha’s altar and were blessed in the pooja; ashes smeared on our foreheads, bells and horns, chanting and our reverent silence. Life has been kind of nuts. My back-to-school-new-to-India jitters have subsided and been replaced with LIFE. In all of the newness and excitement of change, it has been easy to get swept up and away in work and travel and visitors and friends and INDIA! Since the moment I launched to be here, I have been flying. And now it’s April and I can feel my body begging me to land. I’m taking some time to just be still. To listen to the birds calling and the wind whistling through the palms. I am closing my eyes and spending time talking with my mom and remembering where I came from. I am conjuring up the feeling in my stomach I had when I was a shy, little curly-haired girl afraid to jump with the rope swing out into the water. I am remembering days when I was too reserved to say what I really needed, to say how I truly felt. In this stillness, I am honoring those pieces of me; those pieces that remind me of how incredible it feels now to take the leap, to speak up, to show up just as I am. I have been holding on tightly to some old ideas for a long time. Now, in this new space, I open my hands and let those ideas drift off with love and compassion; they served me so well when I needed them. They drift away from me, into the air, like ashes. I’m thinking back to August when I stepped over the threshold into the temple. I remember the questions swirling through my head, the uncertainty, the newness of this chapter. I felt grateful that day to be in such a sacred space with someone who I knew, even then, saw me clearly. I can smell the incense, taste the sweet pongal handed to me with love by Raji, feel the heat and dust of the ancient stones on the bottom of my bare feet. That moment and all those before and since have led me to right now. And in this moment, as I slow down enough to just be still, I know everything is just right. Flying is good. Landing is amazing. I’m wearing close-toed shoes for the first time since I moved. It’s still sandal weather here but I’m flying out tonight and it will be cold where I land. There’s sure to be a lot less traffic there and no cows lazing about in the street; possibly drivers who stop at lights and signal when they turn. I’m sure there will be lines at the cashier in shops and lots less garbage on the side of the road. I think there will be cafes galore, delicious wine from this region and that, croissants and more cheese than I can possibly dream of. I will walk those streets and explore with a new set of eyes. I’m pretty sure where I am going I won’t see crowds of schoolgirls on the street corner in the morning all dressed in plaid with looped braids and strings of jasmine in their hair. 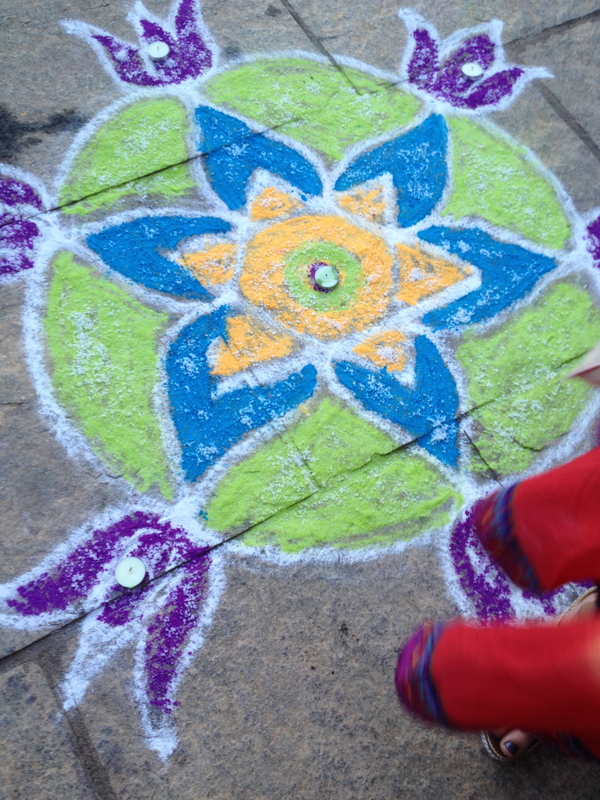 I won’t walk by beautiful, intricate kolams carefully drawn in chalk on the sidewalks lit with candles and adorned with marigolds and rose petals. Or women walking down the road in bright, beautiful saris, chattering in Tamil, on their way to buy bananas. There probably won’t be firecrackers blasting every night in celebration of a festival and surely there won’t be a tiny lit-up shrine to Ganesha at the end of the road smelling of freshly burned incense. It feels weird to be leaving (even for just a few days) a place that, not so long ago, felt so weird to arrive in. The last time I was out of India, I’d never been in India before. What was once my normal doesn’t feel so normal now. I am walking on new ground. Some of the things that I thought I needed are no longer things that I need. There are things that I thought that I knew that I just don’t know anymore. I have been cracked open and all of my insides are exposed and I can’t imagine what it would be like to put that all back in and tuck it away. I am, all at once, amazed and terrified. My desert-worn toes clad with Rajasthani rings wiggle inside of my shoes. When I was 21, I took my backpack and went to Europe. I was alone and trying to get comfortable with that feeling of being myself with total strangers. I tried in Brussels and wound up eating mussels with my mom and stepfather who happened to be in town. I tried in Munich while hoisting a stein of amazing beer at Oktoberfest with about a million other people. I tried in Salzburg while humming Doe-A-Deer as I skipped down the street with my hostel-mate. The more I tried, the stranger I felt. And I tried again in Vienna at the Wiener Staatsoper, grabbing a front row in the cheap standing area for an opera. At intermission, a fellow American tapped me on the shoulder and asked me how I was enjoying the show. She’d lived in Vienna for years and asked me to coffee afterwards. Before we ventured from the opera house, she offered to show me the best view in town and whisked me up the stairs to the balcony of the historic building. Together we looked out over the city, all lit up at night, twinkling and vast and for the first time in weeks, I wasn’t trying to be comfortable, I just was. We skipped coffee and, instead, ventured on a night walking tour of the beautiful city. We talked and talked and shared the stories of our lives. Mine was pretty short at that point… and then we parted with just her recommendation that I return to the opera tomorrow night. When I asked why, she said, “You’ll know when you hear it.” And, she was right. The Marriage of Figaro was on stage and my name was sung in opera all through the night. I was meant to be there that night; I offered to show some fellow standing strangers the amazing view and wound up traveling with two of them for months afterwards. They are dear friends to this day. And, so I didn’t flinch the other night in Bombay when a stranger approached me on famous Chowpaty Beach amidst the crowd. He commented that I was brave to be eating bhel puri from the streetfood stall. Toothless and rocking an Alaska t-shirt, Madhu offered to show me around the beach scene and reminisced about his childhood days there and his daughter’s childhood days there. He asked about my family. We decided to walk together along Marine Drive after we’d watched the sun go down over the city. Madhu is a retired teacher, a psychology enthusiast, a world-traveler, a retired Indian Navy man, a husband, a father, a walking enthusiast and a good, old soul. He challenged me with ethical riddles as we walked, admiring the sea as we pondered choices and why we choose what we choose. When we got to the end of the 3 mile walk, Madhu offered to show me the best view in town. He took me into the Trident Hotel, a fancy, swanky type place and we paused for a bit in the lobby before venturing up to the very top floor where the lights were out. We each leaned up against the glass and peered out at the amazing view of the “queen’s necklace,” the lit-up waterfront that curves around like a sparkling jewel. We were silent and it was a gift. Madhu told stories with great details just like my dad. He was born exactly one month to the day before my mom. I know his favorite places in the world and his deepest hopes for his daughter. He knows who I have left behind in coming here. And after lots of questions, he understands why I am here and what I believe about the goodness of people. I told Madhu on the elevator heading back down about my night in Vienna. He remarked on how vivid the memory still is for me these 17 years later. I told him that I would always remember this, too. The moment a stranger becomes a friend is far too incredible a gift to forget. Last night I spotted a woman in a doorway on a crowded street. I was on my way to dinner with a few new friends; it was dark outside and the hustle and bustle of the crowded street made for a challenging walk. Dodging motorbikes and stray dogs, abandoned shoes, last week’s garbage and a man selling bangles on a blanket, I finally looked up as the lit-up doorway caught my eye. The woman stood with her hands on her hips, glowing in a perfectly wrapped, bright orange sari. Her stance, her sari, her serene presence shook me, and for the first time since I landed on July 24th, it hit me. I am not just visiting India for a few weeks. I am buying food containers and setting up a spice cabinet. I am investing in pots and pans and garbage cans. I am in the beginning stages of friendships of all sorts. I am getting up early and heading in to work. I am starting to know which way to turn to get to a particular shop and how to get back to my house in the dark. This weekend I visited friends who are stuck in the hospital with Dengue Fever. I had cocktails at the home of the U.S. Consulate General. I danced into the wee hours of the morning to 80s music and stood in the rain laughing with friends. I went to a school picnic and had a hot oil hair massage and walked the tree-lined streets of Besant Nagar. I ate paneer tikka masala and dal mahkni and checked out a handmade cane swing for my porch. I wake up to the sound of waves crashing outside of my window. Crows cawing to each other and the street guards chatting away. I know it takes 17 minutes for the water to heat for my shower; I adjust my snoozer accordingly. I know the morning guard wants to speak in English so he quickly says, “good morning!” before I can greet him in Tamil. I jump in a banged-up, bright yellow auto-rickshaw and watch with wonder as my driver weaves his way through the onslaught of cars and bikes and motorbikes, tuk-tuks and trucks. I pass the young guy with the two pugs and the smiling maid. I pass the ironing-wallah and the old man with a rose filled basket on his bike. I arrive at my new school, pour myself a cup of tea and dig into my work. I am starting to learn the names of my co-workers children. Sunita’s birthday is September 20th, Priya’s mother-in-law is staying with her for a month. I know if I don’t leave school by 4:30, I will be stuck in a cluster of traffic that will turn my 5 minute commute into a 50 minute commute. When I get home the guys will be on the beach playing cricket. The couples will be sitting in the sand watching the waves come in. My calendar is filled with new student meetings, yoga begins tomorrow and I have dinner plans on Tuesday. I have been carrying some heavy stuff. Literally, carrying it like a ton of horrendously heavy bricks, in my lower back. I kept thinking that I was unusually calm about my move. Yeah, I was crying here and there when I’d say goodbye to friends or think too much about being far away from my family but, in general, I felt cool as a cucumber. Until exactly one week before my flight when every single emotion I was feeling moved right into my lower back and made itself at home. Classic. The plane ride was somewhat brutal; if not for my adrenaline and some Tylenol PM, I’m sure I would have had to lie down in the aisle and cry. I did come close to having a full cavity search at the Frankfurt airport because I forgot to take off my CVS one-use heating pad before I went through security. Needless to say, I arrived in India unable to get up from sitting down without limping and groaning. I have been carrying Change. And all of the unknown that comes along with it. My new friend Diane empathized and made me an appointment for an Ayurvedic massage. It was time to begin making things right between my mind and my body and, as it turns out, there is an Ayurvedic center just a walk down the beach away from my house. Never one to turn away from massage, I went for it. No discreet removal of the clothes and tucking away under a blanket with a soft knock on the door to see if I’m ready. Papadhi directed me to undress, tied a loincloth on me and escorted me to a wooden table. All without saying a word. If I hadn’t been so scantily clad, I might have bolted from the room then and there but as I climbed up on that hard wooden table and Papadhi prayed over the oil she just heated and touched one drop to the center of my forehead, I knew I was right where I was meant to be. I closed my eyes and let the treatment that millions before me have received, over thousands of years, unfold. I sat down on a little stool inside a steaming box, Papadhi closed the hatch, leaving only my head sticking out and I promptly began to freak out. My calm, Ayurveda bliss disappeared. My mind was whirling: how can I hold myself up like this? how long will I be in here? what if sweat drips into my eye? how long will I be in here? how long will I be…and then Papadhi left the room. I was stuck. Alone. Naked. In a hot box. what if I have to get out and I can’t get out? what if 10 guys come through that door? what if she never comes back? I closed my eyes (solution to sweat not dripping in), I relaxed my shoulders (solution to holding my head up) and I took a deep breath (solution to everything else). And then another breath. When Papadhi let me out I almost fainted. I was buck naked except for my loincloth, with a giant afro, sweating like a beast and unable to see, but I felt just right. Papadhi rubbed all of my stress to the surface and then gave me space to sweat out my fear of the unknown. I walked home on the beach smiling, feeling lighter; waves crashing, wind blowing, kids playing cricket in the sand. Before I moved to India I spent a lot of time thinking about shoes. Ask my friend Denise, she’ll tell you. I obsessed over open-toe vs. closed-toe, the benefits of a rinsable, recyclable sandal, whether I’d need sneakers or sport sandals (yuck!) and everything else shoe related one could possibly obsess over. When I was done with shoes, I moved on to over-thinking about pants, about toiletries, about exactly how much contact solution a girl might need before she can hit up Target again in a year. I am here where it’s dusty and sandy and wet and dirty and hot and all at once smells wonderful and then, in an instant, terrible. I am here where the roads end without warning and the traffic is insane and there are no rules but there are so many rules and there are cows in the streets and the same dog is everywhere and the people… the people! Women draped in bright saris, loops of jasmine in their hair. Men in lungis with wild hair and mustaches galore. Knobby-kneed children in finely pressed school uniforms walk in groups giggling and swinging invisible cricket bats. Tuk-tuks barrel down the road, tooting horns, blaring horns, birds, birds and more birds, the lovely, loopy lilt of people speaking Tamil in the streets, waves crashing outside of my bedroom window. Everything is new. My senses are on serious overdrive and shoes and pants and all that other stuff I was trying to control?